Chestnuts (Castanea), also known as chinquapin and chinkapin, are a nut, a hard-shelled seed of the chestnut tree. Chestnuts are produced by seven species of tree within the Castanea genus. They have creamy white sweet flesh which appears in a number of cuisines, most famously roasted as a holiday food. Chestnut trees also provide valuable timber. Chestnuts can be found for sale in a number of forms, depending on the region of the world that the consumer is in. During the winter, many countries in the Northern hemisphere have whole fresh chestnuts for sale, but chestnuts can also be found preserved in water or syrup, or ground into flour. The Northern hemisphere holds a number of distinct chestnut species, which have intermingled due to human introduction of preferred trees to different regions. All of the trees in the genus are deciduous, meaning that they lose their leaves every winter. The leaves of chestnut trees are simple and broad, with lightly serrated edges. A related species, the chinkapin, native to the American Northwest, looks very similar. The trees produce catkins, which mature into chestnuts in the fall. Each individual chestnut is enclosed in a spiny husk, which cracks open to reveal the brown-hulled nut inside. When selecting whole chestnuts, consumers should look for smooth, glossy specimens which do not rattle inside the hull. Depending on the region, whole fresh chestnuts can be found roughly between September and February. Before they are hulled, the nuts can be stored in a cool dry place, and after the hulls are removed, they should be refrigerated. Chestnut flour should be kept under refrigeration until use. It can be used in ethnic recipes, or much like conventional flour. One of the most classic preparations for chestnuts is roasting. To roast chestnuts, the hulls are slit so that they will not explode during roasting, either in an oven or in a fire. They are placed in a pan, and roasted for approximately 25 minutes, until the hulls become darker and more brittle. Consumers should be advised that the chestnuts are extremely hot, and they should not be peeled immediately, despite the intoxicating aroma. In some ethnic cuisines, a ground flour made from chestnuts is used. Chestnuts are also used in Italian gelato, and they can be found ground into pastes, used in desserts, added to stuffings, and in many other dishes. Savory chestnut dishes such as ravioli are popular in Italy, especially with delicate creamy sauces which enhance the natural flavor of the sweet nuts. Important sources of vitamins and minerals, edible chestnuts are a real help to people with physical and intellectual asthenia, convalescence, elderly and children. For therapeutic purposes, the harvested parts of the edible chestnut are the bark, flowers, leaves and seeds. The fruits have a similar composition to the wheat and are a source of carbohydrates, phosphorus, lecithin and vitamin C. They also contain protides, fat, calcium, iron, magnesium, manganese, zinc, potassium and their caloric value is 200 calories per 100 g.
The gathering of the edible chestnuts happens in late September and early November. Chestnut puree is one of the few products which, heat processed, still maintain in a large amount the vitamins found in the fresh fruit. For internal use, you can use fresh chestnut fruits, which are consumed cooked, boiled or mashed. Edible chestnuts are recommended for people with physical and intellectual asthenia, convalescence, elderly and children because they are rich in minerals and vitamins (less degradable in the preparation process). The mixture of mashed chestnuts and cheese (in equal proportions), sweetened with honey, is an easily digestible food and very energizing. Edible Chestnut leaves develop a sedative action on respiratory organs and are used to treat bronchitis (infusion form). Used as an infusion, chestnut bark helps in reducing the body's temperature. Chestnuts acts as a tonic for the muscles, nerves and veins and reduce capillary permeability. To treat hemorrhoids, varicose veins and thrombophlebitis, it is advisable to eat one bowl of sweetened chestnut puree with honey before breakfast and dinner. It is a diet that should be kept for several weeks. For external uses, very effective are dried chestnuts too. In case of chilblains or rheumatic pain that gets worse when temperature is low, boil five handfuls of chestnut with three liters of water until is reduced by half. After filtering the resulted decoction, wash the affected area with it (its best to use a hot decoct, as much as you can endure). The application takes 10-15 minutes and should be repeated daily until complete healing. Is cosmetics, the chestnut honey mask is used for all skin types, because of its anti-inflammatory properties, reducing capillary fragility, protecting from UV radiation. Also this masks protects the hyaluronic acid in the skin and normalizes sebaceous gland secretion. Results are visible especially in delaying the general process of aging of the skin and revitalizing dry skin, which regain its shape and velvet look. The mask should be kept on the face for 30 minutes and is removed with warm water. 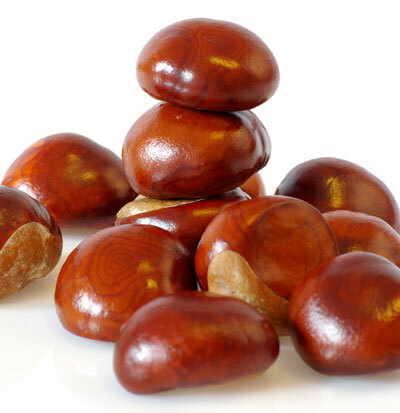 Edible chestnuts or Sweet chestnuts (European chestnut (Castanea sativa); American chestnut (Castanea dentata)), but not horse chestnut (Aesculus hippocastanum (also called Buckeye)), are safe to consume raw with few or no side effects. Raw horse chestnut seed, bark, flower, and leaf are UNSAFE and can even cause death when taken by mouth. Signs of poisoning include stomach upset, kidney problems, muscle twitching, weakness, loss of coordination, enlarged eye pupils, vomiting, diarrhea, depression, paralysis, and stupor. Accidental ingestion of horse chestnut requires prompt medical attention. Children have been poisoned by drinking a tea made from the leaves and twigs or eating seeds. A word of caution for chestnut hunters who live in areas where both the Horse Chestnut and Sweet Chestnut trees grow. Don't trust a chestnut just because you found it near or under a sweet chestnut tree. It is not uncommon for these two trees to grow in close proximity to each other in city settings. Edible chestnuts always come from very spiky seed pods and always have a pointy end on the seed.